Dr Jengo's World: Batman Arkham Origins Collectors' Edition Leaked? 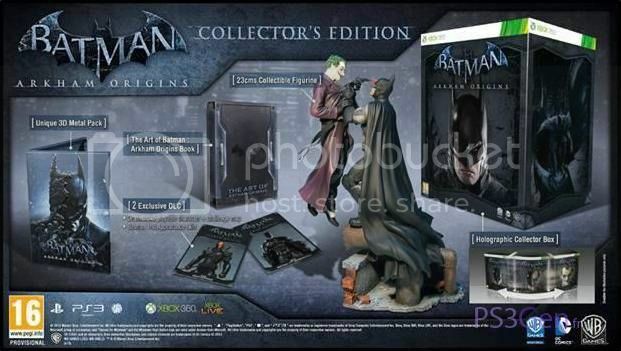 CollectorsEdition.org seems to have found a promo pic of what seems to be the Arkham Origins Collectors' Edition..
That statue!! That has to be one of the coolest CE statues around. It seems to be in the same vein as the Injustice: Gods Among Us Batman vs Wonder Woman statues. I enjoyed the Batman Arkham games but never got into collecting the franchise. I have never really been a Batman fan but I have to admire the figures and statues that have been released for this franchise. Not exactly sure which company is doing this statue but since Mortal Kombat is also under Warner Brother games, I hope to see some Mortal Kombat versus statues that are of the same quality. I'm dying here for some good quality MK statues and figurines! Please Warners Bros, make my wish come true! Coming back to the topic... just a reminder that the above pic, is not officially announced and could very well be a fake but I'll put my bets on it being real. The CE also comes with a Holographic Collector Box, Art of Arkham Origins book, 2 exclusive DLC and a Metalpak. Metalpak? I don't collect those but aren't Metalpaks a cheaper version of the popular Steelbooks? That's a downside for this otherwise fantastic-looking Collector's Edition..